Apple today has pushed out an update for Find My iPhone, with a redesigned iOS 7-like icon. The icon is the same that you can find in the beta.icloud.com, updated earlier this month with a new set of iOS 7 icons. 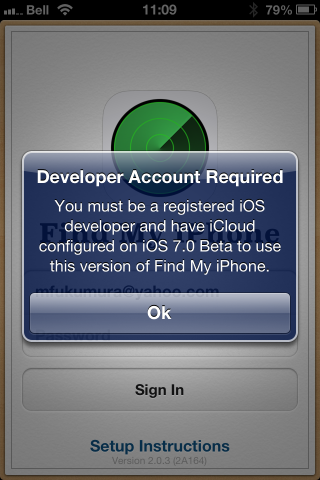 However, there is an issue with the new update: after installing it, the Find My iPhone app gives an error message to everyone who tries to use it without being a registered developer or has access to a developer account. The update comes to address bugs, but it will likely followed by another update shortly. Until then we recommend regular users not update the application. Update: The error has been fixed, according to Apple’s System Status page.